On the far side of the inlet, nestled on the small patches of sand between large rocks were a couple of extended family groups, with children ranging in ages from a very vocal two year old to teenage. With wind-breaks pegged into the sand and folding chairs set up, they had been there for the whole day. Another family picked their way across the rocks, barefoot and in wetsuits to jump from the lower ledges, gaining confidence to later try the high rocks on the opposite side. As we got closer and the whole of the Slough came into view, a bright pink li-lo starkly contrasted with the teal-green deep water. Drifting on this was young man, long hair tied back calling instructions to his friends on the rocks. Another then threw down a large rubber ring and took a great leap from on high to land in the centre. We all laughed and clapped at his display. Kealan and I headed to these high rocks. Kealan jumped first and as I stepped forward I felt a twinge of nerves. My cautious nature made me hesitate and assess the depth, judge the distance I would need to jump out to clear the rock walls and my heart beat faster as I realised there was no turning back. 3-2-1- jump! I think I might have squealed a little! My feet hit the water and I pulled my arms in close to my body, as soon as I was underwater I opened my arms and used a breast stroke kick to stop myself from hitting the bottom. I needn’t have bothered, wearing my wetsuit I was so buoyant that I popped up again like a cork and bobbed about in the gentle ebb and flow of the inlet. Barefoot I climbed back up the rocks for a second go. Then it was time to lose the wetsuit. 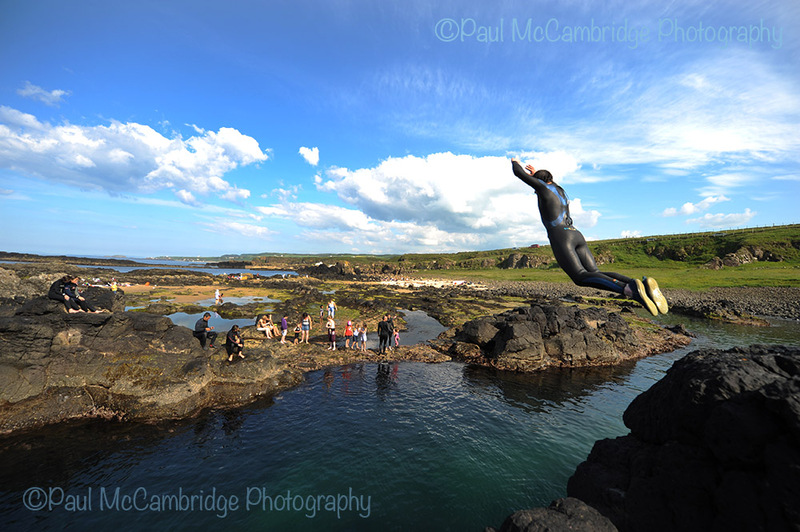 The black rocks were warm with the sun beating on them all day and after a few more jumps, and Kealan somersaulting a couple of times, I felt a dive was in order. Nothing spectacular, just a clean straight dive, start low and work up to one of the higher rocks. I tested myself on a low rock, ever cautious of the depth, and executed a passable straight dive, next step, a little higher. The higher I went the more respect I felt for cliff divers, I would never be brave enough for that. A couple more dives and then I thought I should quit while I was ahead and embarrassment free, maybe with some diving practice I’ll return brave enough to resurrect my somersault, I don’t promise anything though. 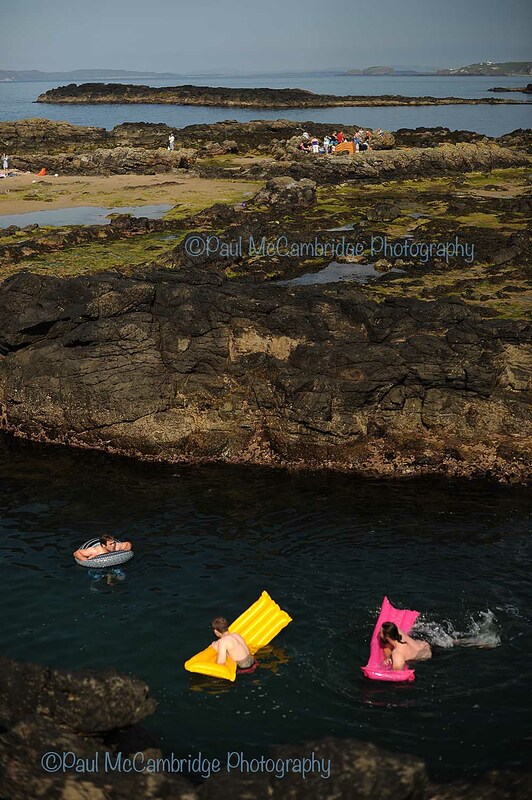 I warmed myself on the black rocks as the groups of people began to disperse and we agreed that a long days swimming and exploring now warranted a good feed, the evening sun still strong as we dressed. A lovely inlet with varying levels to plunge from which should satisfy most age ranges.